It is a long time I have started a discussion, I have attached here a print which iam not able to tell whether it is a loop or no loop or comb pattern or it is no pattern. can somebody help me out in this regard. I think it would be considered a vestige bordering on a comb. I wouldn't describe it as any pattern at all, because basically all I see are ridges directed in sort of the same direction (with some of them ending, and some are fusing). I see no ridges that could justify to call it a 'comb', nor a 'vestige'... because both would require the presence of number ridges that clearly have a different direction than the surrounding ridges. Thanks for providing inputs, do appreciate your intiative on this. It seems to me like a comb, but iam not able to precisley mention about triradius. But what is a vestige does it have triradius. Martijn, thanks for your input, but my intuition tells me that there is some kind of patterning but not sure which one. I have one more print which i will show you later i dont have it right now with me where there is a loop but not sure about the triradius part. It looks like there are few triradius. Unless i show the print can the doubts be clariified. My understanding of a vestige is that it is the smallest remnant of a pattern. Here there appears to be a shape that is not quite a comb, not quite a loop, with not quite a second triradii. "Vestiges are conspicuous local disarrangements of ridges, not conforming to the definition of a true pattern but suggesting an approach toward the construction of a pattern." Cummins & Midlo "Finger Prints Palms & Soles"
Thanks for the defintion and input, so it looks there was some kind of approach towards a pattern formation during the devlopement of ridges then suddenly it stopped which implies that some indication of pattern was forming and stopped defintely a tendency towards a pattern formation is there. So under palmistry what kind of meanign should be given for such kind of occurences in mercury mount, like you cannot say totoally it is pattern nor can we say complete formation of triradius. Also i will post few more pattern which i have doubts about classification. My own opinion is that a final formation isn't necessarily something that if there were more time or space a full pattern would form, although that could be the case sometimes. It is what it is, as is. Not something that stopped forming and becomes incomplete. It just doesn't conform to the requirements of a complete pattern. Sometimes it could just be the genetic mix of one parent having a loop and the other not having a loop and their child getting some combination of the two. "Ordinarily a vestige is merely a local disarrangement of ridges which converge abruptly or a system of straight and parallel ridges which differ in direction from those surrounding the vestige area." In Anand's example there is no real 'local disarrangement', nor is there 'a system of straight and parallel ridges which differ in direction'; therefore I had to conclude that there is no pattern. Because basically all ridge-groups outside the normal triradius are running parallel to each other (with only a small diverging/converging angle). Anand, beyond the normal triradius there is no 'true' patterning inside your example; there are only a couple of terminating ridges (that end between two other ridges). But all those terminating ridges basically have the same direction as the surrouding ridge bundles, and therefore this can be described as a normal variant of ridges that do not fit the definition of any 'true' primary type of ridge configuration. "A comb is a ridge formation in which three or more parallel ridges join another ridge almost at right angles to their direction of flow." And on the same page they describe figure 3.5F in the picture below as a 'comb'; but in your example this characteristic is clearly not present. I agree with you that there is definitely a shape, also I did check with the person mother hand and she has loop of humour at that place, I could not get the data for the person father hand. But there is high possibility that in between there is some kind of formation due to the genetic mix or whatever can be called or inheritance. So definetly you could be right on that judgement. I do agree that there is some kind of shape to this pattern and it probably does not fit into the definition of a complete pattern. Iam still not agreeing with you that there is no pattern, there is a shape to it. Intuition is some kind of feeling which is inner feeling for which remembrance of a comb definition or a loop definition is not necessary, it is just an feeling and feeling don't get offtrack by definition. It is like I find somebody genuine and I find somebody not, for that I gather a precise definition of this is what is genuine and this what is not is not necessary and also look at all facts to gather information whether his actions is genuine or is not necessary for intuition . Thanks for your picture on triradius and ridges, information. In the zone where we can observe some merging- and ending ridges, the direction of the ridges does not change at all... and for this reason this example can not be described as having enough of the characteristics required for a 'comb' (nor for a 'vestige'). And thus the pattern is just 'empty', which simply means here that there is no true pattern between the triradii under the index finger and the middle finger pinky and ring finger... and there nothing unusual about this example at all, because in most hands one can see in that region of the hand a few ridges ending and/or merging. PS. Your initial question was crystal clear as described in the title of this topic, where you appeared to wonder about whether it's a 'comb pattern' or 'no pattern' at all (and in your first post you also wondered about whether it could be a loop-comb). But now your question became much more diffuse... because after I described why there is no basis to associate this example with any 'true' pattern at all, it appears that you now try to adress abnormal meaning... to perfectly normal ridge-variation. My advice would be to simly ignore such minor details regarding pattern-classification (as the essential characteristics to call this example a 'comb' or 'vestige'... are missing: because basically all ridges are sort of running parallel to each other!). I don't think you are the only expert here and it does not mean I have to agree to all of your conclusion, I have to look at what other people have to say like patti has mentioned it is vestige towards a comb, and she has mentioned that there is a shape. Also matrijn you have mentioned wrongly, it is on the mercury mount, which is not between index and middle finger. and I don't think after your reply my answer have become diffuse first of all why should it You have mentioned no basis, my question is about all other experts opinion. If I go with patti opinion I will say it is a vestige, so there is a basis. I have a choice on that front. Patti is also an expert in this area so why should I agree with you alone. You have also mentioned there is nothing unusual about this example, for you it might be nothing unusual but for me it is unusual and I don't understand why you had to mention that. I had kept the title and asked a question in reference to usual discussion which are in the forum which involve partly about reading hands dermatoglyphics wherein pattern classification have been placed some importance. In view of this I had created a title by that name. According to your view it is not a pattern, according to patti's view it is a vestige towards a comb for which my judgement about my own intuition agrees saying that there is some kind of a shape or pattern and definitely there would some kind of palmistry meaning to it, so probably I should have kept a title is my intuition right. I need other experts to also conclude, you alone will not convince my clarification, and iam not a person who gets easily convinced . This is correct, there is no pattern. A vestige is not a pattern, it just somewhat resembles one. I'll add that from my experience this location between the little finger and ring finger is the most common place for this type of configuration of ridges. The more familiar vestige is the formation called the 'bee' on the upper thenar mount. Because it is an enclosed set of ridges at right angles, it is more seen as a complete 'pattern' which this sample here does not do. Vestiges can appear anywhere we typically can find a pattern, e.g. the volar pads. Thank you for correcting where I mentioned index- and middle finger (I have corrected this now in my previous post). I don't understand what Patti exactly has in mind with "a vestige bordering on a comb"; but the definitions that I have presented earlier indicate that such a combination would actually in your example at least require the presence of an extra triradius positioned between the two triradii under the pinky and ring finger... but there is no such third triradius at all! And thus there is no basis to assume that there is a 'comb', a 'vestige', or a combination of both...unless one is using an inaccurate perception regarding what those two patterns really require! So Anand, since it appears to me that you prefer to ignore BOTH DEFINITIONS for the 'comb' and 'vestige' that I have presented... you leave me wondering about what definition you have been using for a 'comb' anyway??? PS. I should add here that I can not support Patti's definition of a vestige: "My understanding of a vestige is that it is the smallest remnant of a pattern", because the size is actually completely irrelevant in a vestige. The essence of a vestige is the presence of a ridge-field that has a different direction compared to all surrounding ridge fields (see the earlier definition that I quoted from Cummins & Midlo, 1943). Martijn, a comb is a pattern, a vestige is not a pattern. Look up the word vestige, it means the remnants of something coming or going. Something appearing incomplete. Here this formation has the appearance of forming into or out of a comb or a loop, but of course is not. I think you have a misunderstanding of a vestige as you keep referring to it as a pattern. I wasn't exactly referring to size when I said smallest. I was referring to the faintest resemblance to a pattern. A remnant, a vestige. Thanks for clarifying the confusion, but what do you mean by "I think it would be considered a vestige bordering on a comb. ", but does vestige imply something in palmistry, but it appears there is some kind of shape added to like a pattern when you have a look. How to go about in such cases. "Vestiges can appear anywhere we typically can find a pattern, e.g. the volar pads " also why did you mention looks towards triradius "My understanding of a vestige is that it is the smallest remnant of a pattern. Here there appears to be a shape that is not quite a comb, not quite a loop, with not quite a second triradii." Thank you for your attempt to acknowledge that my observation that there is no pattern is correct... but I actually described that there is also no vestige, because the presence of a vestige would indicate the represent the presence of a pattern - however the vestige itself is not recognized as a 'true pattern'. By the way, on page 105 in Cummins & Midlo we can read that for the palm the whorl (W), loop (L), vestige (V), and open field (O) are considered as the basic elements to describe a full palm. The whorl and loop represent a 'true pattern', but only the 'open field' is represents the missing of a 'true pattern'. And thus the 'vestige' does represent the presence of a pattern... but it is should only not described as a 'true pattern'! So I think you misunderstood the essential requirement in order to talk about a vestige: the aspect of the presence of a ridge field that has a different direction than the surrounding ridge fields; see the example on p.105. Sorry, I have not much to proceed, because so far you only shared some associations without explaining what you have actually observed regarding the ridge details in Anand's example. Patti, what exactly made you think that Anand's example has a 'vestige'? Anand... very nice to see that you now finally yourself have started wondering + sharing questions about how to understand Patti's words. The picture below presents a typical example of a 'vestige' (which is here positioned BETWEEN a proximal loop on the lower thenar and a radial loop on the upper thenar); but I should add here that sometimes a vestige can also become manifest without the presence of any loop or whorl in the surrounding ridge fields... but even then the direction of the surrounding ridge fields are quired to show a different direction, because that is the essential characteristic of a 'vestige' ridge field! You have mentioned no pattern because it is not vestige, but iam saying there is an shape which is what vestige indicative of. My doubt is on the tririadis aspect, which is where iam confused in the way patti has mentioned. "Anand... very nice to see that you now finally yourself have started wondering + sharing questions about how to understand Patti's words"
Anand, again, I wondered about what exactly do you have in mind with a 'comb'? And I am also wondering how to understand your use of the words 'vestige' and 'shape'? Please be aware, despite that I described why I think there is no 'pattern'... 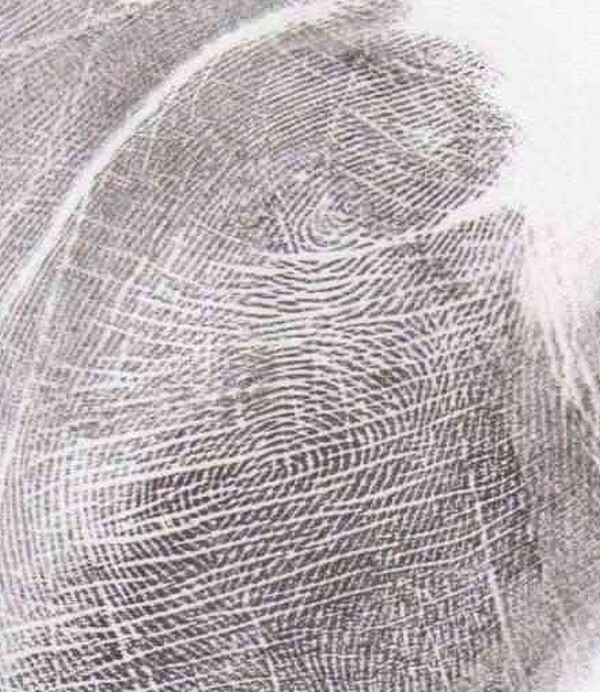 I also described by detailed that I do observe some ending- and/or fusing ridges; but those are not sufficient to speak of a 'pattern' (nor a 'true pattern', nor a 'shape', nor a 'vestige', nor a 'comb') nor any other dermatoglyphic pattern at all. Because those details represent the so-called minitiae or individual 'ridge characteristics' of the dermatoglyphics; but those minor details do not make a dermatoglyphic pattern or shape! "... but what do you mean by "I think it would be considered a vestige bordering on a comb."" To me your question to Patti indicates that despite that you initially liked Patti's answer, it now actually makes you wonder about what Patti's words really implicate. Patti wrote: Martijn, a comb is a pattern, a vestige is not a pattern. Look up the word vestige, it means the remnants of something coming or going. Something appearing incomplete. Here this formation has the appearance of forming into or out of a comb or a loop, but of course is not. 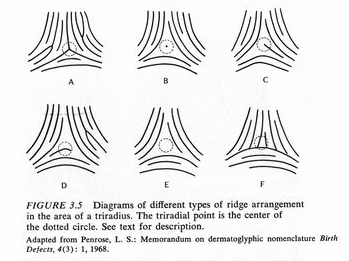 Patti, this is not how a 'vestige' is defined in the field of dermatoglyphics; because the presence of a ridge field that is directed differently compared to the surrounding ridge fields is essential. Patti, beyond my word choice, formally one can describe a 'vestige' as a (quoted from Cummins & Midlo, page 105): "localized disarrangement of ridge course". That is why I described that 'vestiges' are no 'true patterns'... but informally speaking one can recognize it as an incomplete 'pattern' anyway, and thus I described it as a 'pattern' (just like an ARCH fingerprint can be described as a 'pattern', but formally arches do not belong to the 'true patterns' either!!!)... but only in the perspective that loops and whorls represent the 'true patterns'. This implicates that a certain variation in ridge field course/direction is essential before one can speak of a 'vestige'... but I think it is obvious that such a characteristic is actually completely missing in Anand's example. And thus I recognize how your suggestion (about that you perceive that I misunderstood things) is likely the result of your inability to read the context of how I described the 'vestige' as a pattern. I have described via the vestige-definition shared by Cummins & Midlo why Anand's example can not be described as a vestige; but meanwhile you haven't shared any observation nor a definition that supports your assumption regarding the 'vestige' in regard to Anand's example. PS. The so-called 'music bee' can be recognized as the popularized variant of a 'vestige'.